Bespoke shepherds hut nestled amongst copious trees and overlooking the Norfolk wildlife trust. Thompson Hall Retreat is located in the heart of Norfolk. The shepherd huts are nestled amongst copious trees over looking neighbouring arable land and the Norfolk wild life trust. Each of the huts can accommodate 2 adults, inside you will find a comfortable luxury kingsized bed with pillows, duvets and sheets provided. The kitchen/living area has a fitted kitchen with a gas hob, fridge, kettle and a microwave along with a wood burner to keep you toasty warm. There is a private en-suite bathroom with a large shower, flushing toilet, wash basin, Illuminated mirror and a electric hand rail. Walk out onto your own veranda fitted with a luxury bathtub where you can lay back, relax and enjoy the stars with your favourite bubbles. On the other side of the veranda you will find the al fresco dining area which has a fully equipped kitchen, combi oven and gas fire pit. Buy one our Twilight hampers and finish the evening full of tempting delight toasting marshmallows over the flames, sipping hot chocolate and listening to pop corn kernel exploding in the sauce pan. If you like a walk in the morning the sunrise is beautiful over Thompson's Lake which is about a mile away from your hut, located just off Pedders Way. It is 32 acres in size and brimming with beauty and wildlife. Make sure you order one of our retreat hampers, packed with goodies ranging from the BBQ hamper box filled with a selection of meats, vine tomatoes, ketchup and salad, or the Twilight hamper box filled with marshmallows, chocolate digestives, nutella, sweet waffles, strawberries and 2 tubs of ice-cream! The perfect place to hide away from the world, rediscover nature and spend time recharging your energy under the canopies of mature trees in King Edward VIII Wood. Thompson Hall Retreat is located in the heart of Norfolk, at the bottom of Hall Lane which is accessed via an unmarked track across arable field. Follow the drive which is canopied by mature Beech and Elm Trees until you reach the meadow. The shepherd huts are nestled amongst copious trees over looking neighbouring arable land and the Norfolk wild life trust. Each shepherds hut (Hartley Hut, Bishy Barney Bee & Whoa-Stop) comes with a luxury king sized bed for 2, kitchenette (featuring microwave, wood burner, fridge-freezer and gas hob), and bathroom (with large shower, illuminated mirror, electric towel rail, wash basin and proper flushing loo). 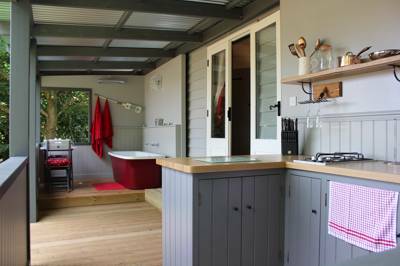 The veranda features a double ended bath, plus a fully equipped kitchen with combi-oven. There's an al fresco dining area and gas firepit. All basic washing-up provisions are provided (towels, dish cloths, washing up liquid) plus complimentary toiletries. Dogs are permitted in Whoa-Stop and you can even bring your horses as part of a livery package. The 46-mile long Pedders Way is the ancient Roman road running through the Norfolk Brecks, Thetford Forest and all the way to Hunstanton on the North Norfolk Coast. It's cycle and horse friendly too if you fancy a two-wheeled/four-hooved adventure. Thetford Forest itself is the UK's largest lowland forest with over 47,000 acres to explore. Woodland walks, mountain biking trails and a rich array of wildlife are all on offer. The Pingo Trail is another unmissable walk that takes in the many ancient woodland ponds that dot the region – don't forget your wellies! And of course, it wouldn't be a visit to Thetford without dropping in at the Dad's Army Museum (07562 688641). The town played the role of Walmingham-on-Sea, the fictitious seaside town that served as the setting for Captain Mainwaring's calamitous corps in the iconic BBC sitcom. There's a range of bespoke hampers on offer from cheese and Steaks to breakfast, BBQ and that all important hot chocolate box. The local watering hole The Chequers Inn (01953 483360) is a quintessential English pub with thatched roof, real ales, and wholesome pub grub. For a romantic evening meal out, The Mulberry (01842 824 122) offers a superlative choice of Mediterranean-inspired dishes that make use of Norfolk's finest local produce. Thompson is just off the A1075. For SatNav please use IP24 1PZ. 3 shepherds huts each sleeping up to 2.